Brief Description: Water Pipe Cleaning Equipment,Water Pipe Scale Remover, just as its description,is a revolutionary tool kit to clean your home plumbing lines,water pipe lines,to remove scales and rusts from pipe,and thus to keep coming water more soft and more clear.It is also used to clean floor heating pipe to get better heat radiation,save energy cost and pro-long water pipe service life.Utilizing high pressure air and aerial pulse principle to remove long-years scale which is strongly attached onto the inner pipe.Equip with over-pressure alarm,when the pressure in pipe is over than the maxium or block in pipe,the machine will alarm. It`s a revolutionaly design in world,as it can protect your pipe from break because of too high pressure…..Multifunction,it can also be used for cleaning water heater. System power input: AC100V-240V, 50-60Hz. Output DC24V. 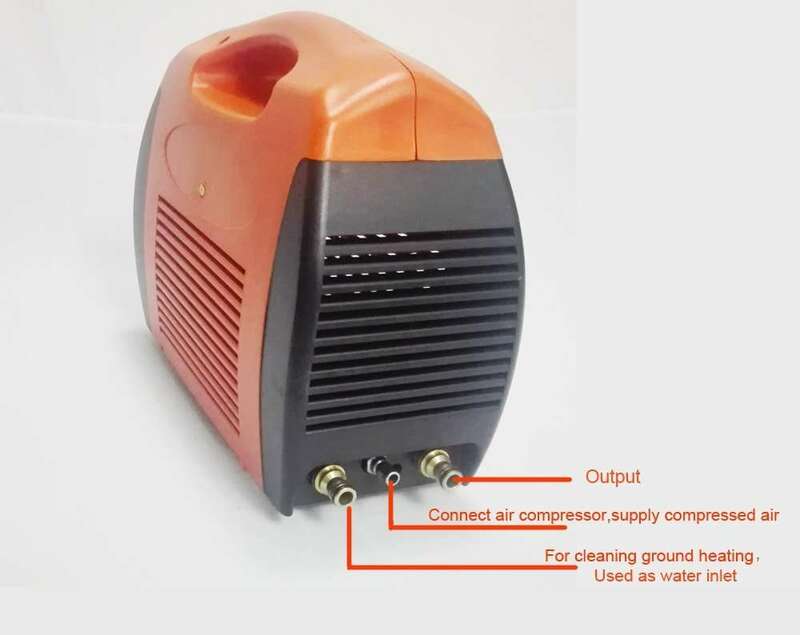 Notice: The buyer can buy Air Compressor in his local market. 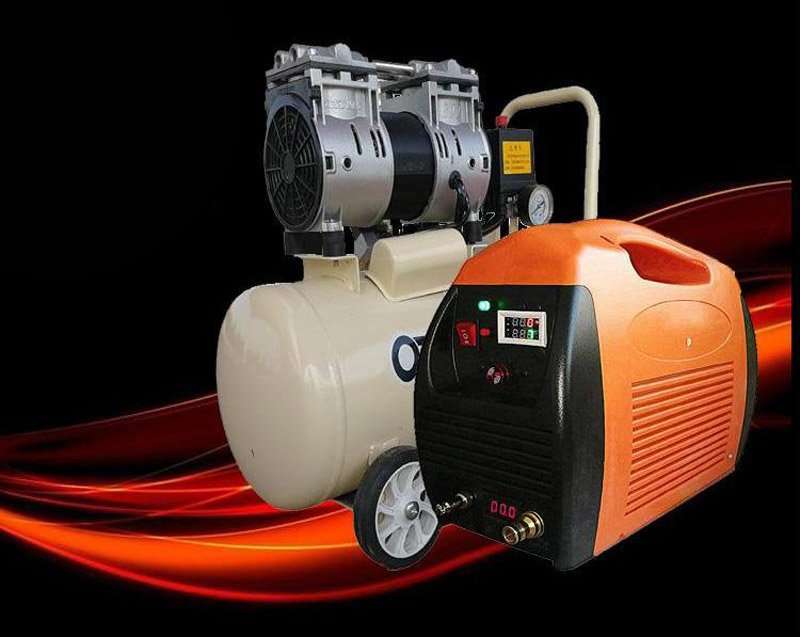 The requirement on air compressor: power >750w and air produced >30L,Max pressure 0.8Mpa. 13. Remote controller for the machine,put the plug of 15 into it,and then put the remoting plug into power source,then can have remote controlling function. 16. Tool bag. Arrange all parts above listed into the bag.Easy to take. How to cleaning water pipeline system using “Water Pipe Cleaning Equipment”? It`s easy and you can clean your water pipe easily with our machine,not only for your own house cleaning,but also for commerical purpose cleaning,please check the following steps.After one-time operation,you will be skilled at cleaning. Step 1, Check water pipeline system and close valves and faucets. Check with eye to see if there is leak phenomenon when no use water.Close all faucets,and see if water gauge still run slowly or not. Step 2, Find inlet faucet for cleaning work and Connect cleaning machine system. 1,Usually,there are installed many faucets along with water pipe system in a building,and so,which one can be used as inlet faucet for machine when start cleaning work? —-In general,there are three principles for your reference: 1), The faucet is close to Total valave. 2),The faucet is lower to ground. 3),The faucet is easy connecting to machine. Any faucet which can meet two principles above mentioned can be used as cleaning inlet faucet. 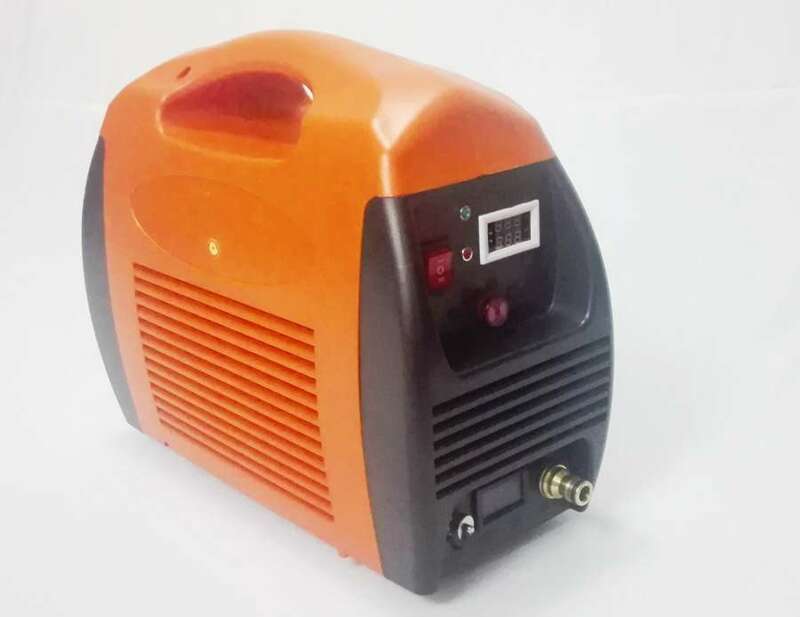 2,Ready to have cleaning machines and accessories (supplied by smartclima), and ready to have air compressor(supplied by user himself,any model is ok to meet following specification: air produced >30L,>750W). 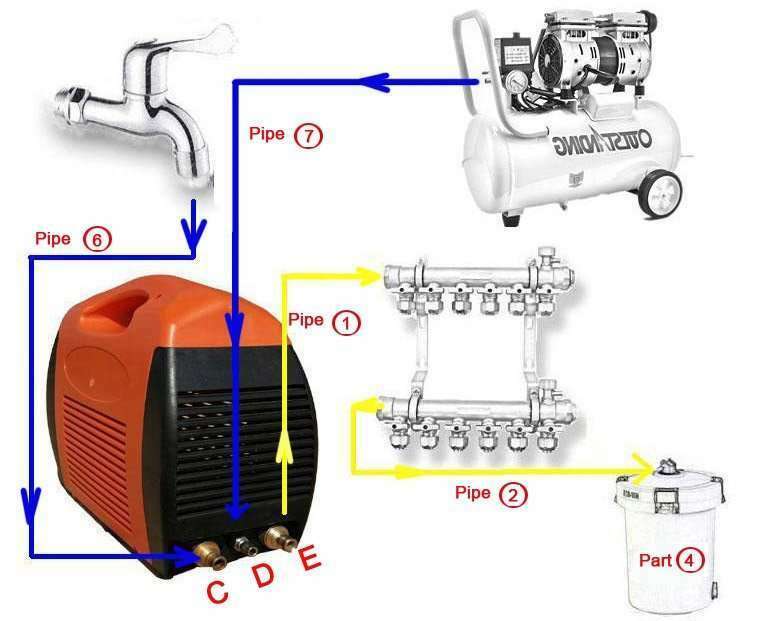 connect air compressor and cleaning machine with pipe 7(see above pictures). 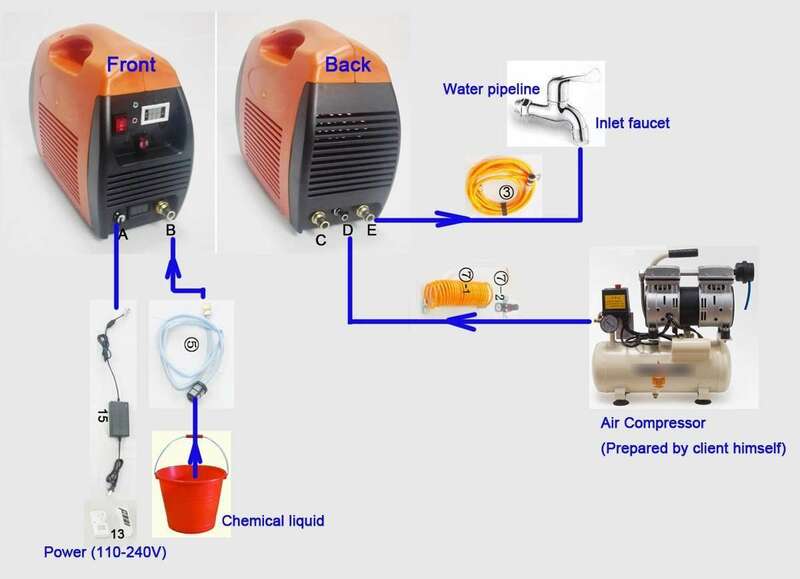 connect port E and “cleaning inlet faucet” with pipe 3.
connect port D with pipe 5,and the filter is put in chemical liquid liquid. connect plug A with power converter 13,it accept voltage 100-240V,50Hz/60Hz. Insert plug 15 into plug 13,and then put plug 13 into power source, it is used for remote controlling device to control the machine on or off. Step 3, Drain out the balanced water in pipe,close faucets. Close Total valve,if there are installed with other equipment of heat exchanges(i.e, water heater, radiator,etc. ), close its all valves,to avoid chemical liquid flow in.Open the highest faucet,swich the machine to “II” and swich on your air compressor,to drain out the balanced water in pipe.and then switch off machine. Step 4, Test leakage(If you already did Step 1,then can skip this step). If you want,can test leakage to pipe before cleaning.After drain out the balanced water,close all faucets. Swich the machine to “II” ,Set pulse frequency to be 3(up number)and 7(down number),and then swich on your air compressor to pump compressed air into the pipeline until the pressure gauge showing “3”,stop air compressor,wait 3-5minutes to check if the number at pressure gauge reduce or not. 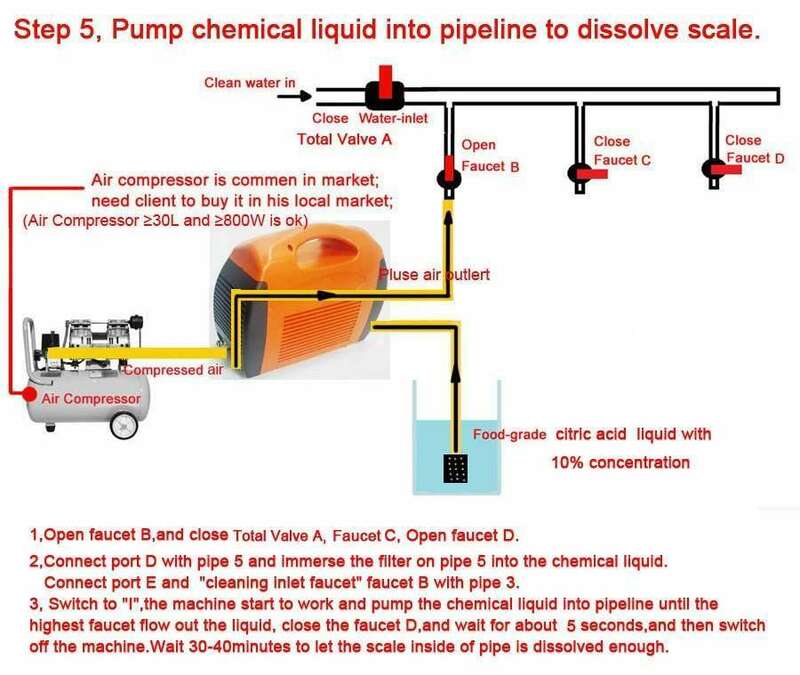 Step 5, Pump chemical liquid into pipeline to dissolve scale. 1.ready to have food-grade citric acid powder and hot water(40℃-60℃),dissolve citric acid into warm water with 10% concentration(i.e. 1kg citric acid dissolve into 10kg water) to get cleaning chemical liquid. 2, immerse the filter on pipe 5 into the chemical liquid, and switch to “I”,the machine start to work and pump the chemical liquid into pipeline until the highest faucet flow out the liquid,wait for 5seconds,and then close the highest faucet.Switch off the machine.Wait 30-40minutes to let the scale inside of pipe is dissolved enough. If local water quality is very bad or the scale in pipe is serious,can increase the liquid`s concentration (i.e. 1kg citric acid dissolve into 8kg water),also can extend liquid staying time in pipe to 60minutes. Step 6, Compressed air pulse cleaning. So,chemical liquid dissolving scale has been finished in above operation,and now it`s time to use cleaning machine to flush away the loosen scale and cleaning pipe. 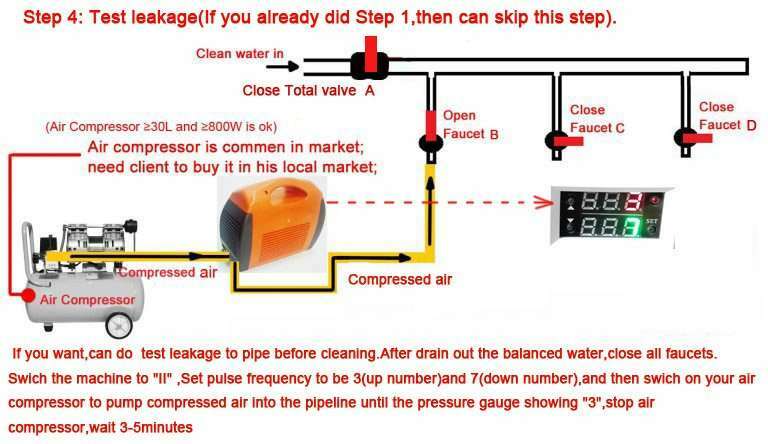 Swich the machine to “II” ,Set pulse frequency to be 3(up number)and 1(down number), Open the total valve and open one faucet which is going to be cleaned,then swich on your air compressor, the cleaning machine start cleaning pipe until to flow out clean water (take about 15minutes). Then open another faucet and close the cleaned faucet,then start the second faucet cleaning…Do same operation for the other faucets cleaning. * Pulse rate setting: Short-time push “Set” key,the number on screen flash,push ARROW key to increase or reduce number. * If one building has many floors,clean one floor by one floor,i.e.one building has 4 floors,it`s better start to clean form 4th floor,then to clean 3rd floor,2nd floor,finally clean 1st floor,from up to down,one floor by one floor. * For some old buildings with many years pipe,you can adjust air pressure to wash.
How to cleaning Ground Heating System using “Water Pipe Cleaning Equipment”? It can get better cleaing effect with cleaning one floor by one floor,i.e. as above photo indicating,it`s better to clean 4th floor first of all,then clean 3rd floor,2nd floor,1st floor,from up to down,one floor by one floor. You can add hydrochloric or sulphuric acid to the water to lower the pH in your water pipes. Ask a water treatment specialist to do this. Wash one circuit by one circuit. How to cleaning Water Heater using “Water Pipe Cleaning Equipment”? Notice: When cleaning water heater, it is a recycle system,they are composed by: water heater, chemical liquid bucket,cleaning machine,and pipes. 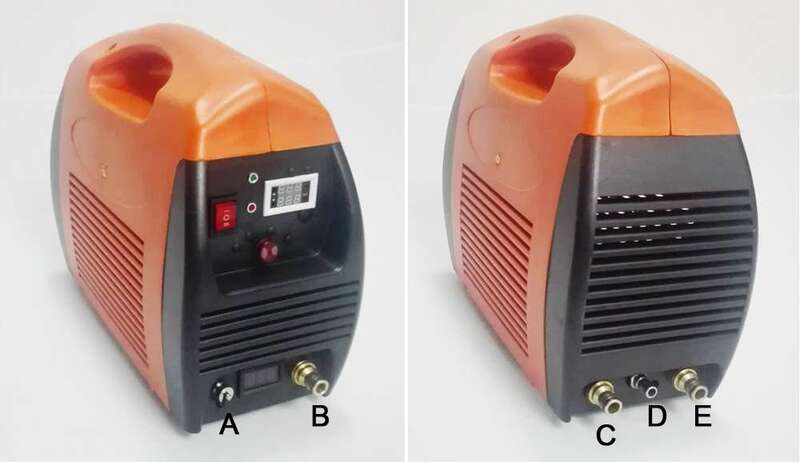 Notice: You can buy air pump in your local market.Any air pump which is bigger than 800W and 30L is ok.
Notice: If choose Option B,the delivery method will be shipping by sea/boat only,because air company doesn`t permit to delivery air pump. If operate cleaning pipe work as usual,you must call your water company or water treatment specialist to ask for a water analysis to see if you have hard water and to test the pH of your water. With Smartclima Water Pipe Cleaning Equipment,you can ignore above action,and clean your water pipe D.I.Y,without complicated tools,you can get soft and clear water immediately! 1. Intelligent pressure controller has been set to the maximum pressure limit of 7.5bar when washing floor heating,and set a password to lock, the customer can not change it without password.Any new settings need to enter the password to unlock it. 2. With Air Pressure controller,Pressure limit can be adjusted according to pipe type,pipe material, pipe age,and scaling heavy or not. An approximate pressure value for reference. (1) 7.5bar for washing floor heating pipe. (2) 3-4bar for washing wall-mounted water heatingf boiler. (3) 6-7bar for washing Radiant iron water pipes,and 5-6.5bar for washing plastic PPR pipe. (4) Up to 5.5bar for washing other plastic pipe or aluminium-plastic pipe. With operating “Pulse Frequency digital regulator”,the Aerial Pulse Frequency can be set to determine the time of shut on or shut off automatically. Question: Is it necessary to wash water pipe? If do not wash, what dirty materials will stay in pipe? Answer:Maybe you feel that the water from your taps are clean…And maybe you will say that the left image is exaggerating…But if you cut your water pipe and check inside situation,you`ll be very surprised to its dirty and attached materials.Any water pipe will be attached scales .washing pipe is absolutely necessary, if you do not wash, water pipes will breed E. coli, Legionella, enterovirus, microcystin toxin would stocking bad heavy metal arsenic, lead, cadmium, mercury, etc., they can cause serious rust,and the water pipes will be blocked ,water flow become small and slow.If you wash your face with this kind of water,your skin will become bad and bad;If you drink this kind of water,the metal material unseen will be deposited in your body and thus to danger your health with long days. .. Question: Will all material pipes become dirty after long days? Have to be cleaned? Answer: According to SGS test report shows that the water quality in the unwashed water pipe is more 6.5 times dirty that that cleaned water pipe. And so,water from ordinary tap may seem clear, but because the water wall filth, so the water flow will take out a little scale, so that the water you are using is dirty. SGS also detected that the water from water pipes containing up to 0.19ml / L of Pb ingredients and other heavy metals not included in the test items, including iron, mercury, arsenic, cadmium. 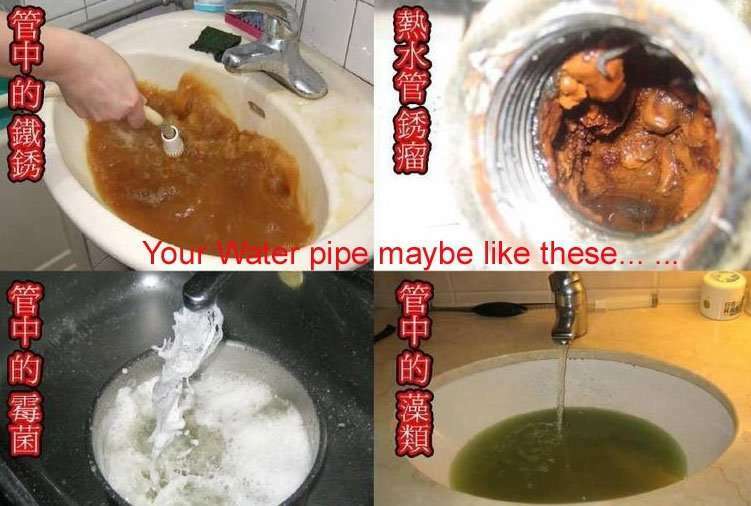 According to the color of water, can determine the dirt ingredients: plastic pipe is easy to stock algae dirt, so cleaned water from plastic pipe is whitish or pale green or pale yellow;raw iron pipe is rust easily, so water is brown; If you use groundwater, regardless of iron pipe or plastic pipe,water is very dark and black. Relatively new buildings,they will use the stainless steel pipe or copper pipe, but after long time,can get water with whitish sticky bacteria and algae. Question: What`s principle for the cleaning machine? Answer: the first is to use soluble chemical medicine, than the other two ways. Question: What is Pressure Aerial pulse cleaning technology? 1,If you want, can be No use any chemicals, no corrosion to the pipe network,no pollution to water .It is a green and safe-environment technology. 2, Non-blocking, practical, suitable for all complex pipe network. 3, Fast and efficient, saving time and less working. 4, Save energy money and good cleaning effect. Because cleaning is based on air and water as the medium, so it is low cost compared with other cleaning methods, and can remove more than 95% rust and deposited scales outside the system, recovery water supply capacity and improve heating effect. 5, Esy to inspect the cleaning quality. 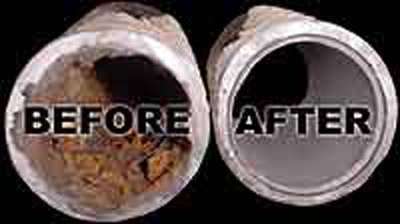 You can compare the pipe inside before and after cleaning with your eye easily. Question: What principle does Smartclima Water Pipe Cleaning Equipment? 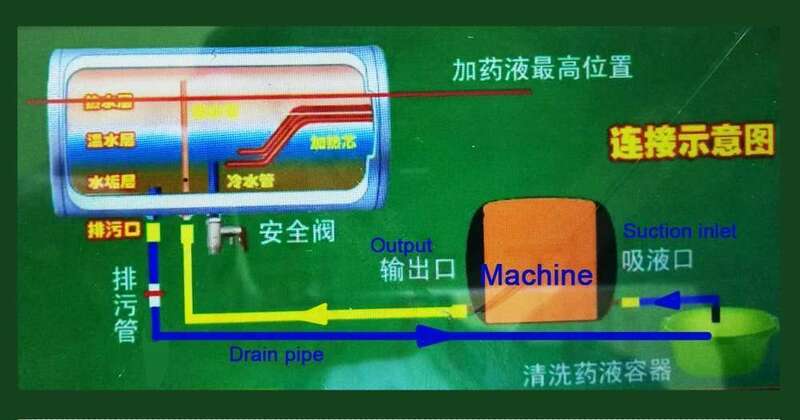 Answer: the first is to use soluble chemical medicine to dissolve the scale inside of pipe,and then use high-frequency(Pressure Aerial pulse) cleaning technology, utilizing high compressed air and high frequency and computer microcontroller, can produce four different wave energy, the advantage is fast, safe and effective, the costs are the lowest. Pressure Aerial pulse cleaning technology with microcomputer control . aerial pulse,fast back and forth against the wash, wash and high frequency ring spiral side shock-peel and other four swings, which is the most rapid and effective cleaning method among several cleaning method . Water hammer straight flush: water hammer pressure waves produce strong, straight flush dirt inside pipes. Quick back and forth backwash: In good times or bad quick wave back and forth, repeatedly flushing water pipe wall. Spiral ring side wash: wash water in a spiral fashion wave wall depression scale slit card. 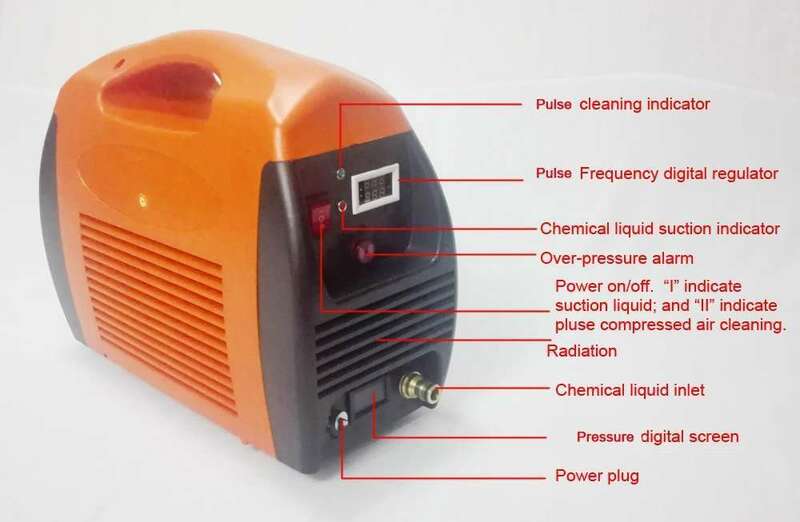 High-frequency shock-peel: inner tube vacuum generates high frequency, create a lot of blisters, blisters rupture shock so foreign body peeling wall. 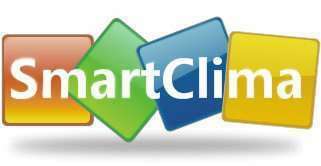 Question: What plumbing lines in home can be washed with Smartclima Water Pipe Cleaning Equipment? Answer: All water plumbing pipe of family use can be cleaned with Smartclima Water Pipe Cleaning Equipment, including: bathroom sink of hot and cold water, hot and cold water lotus canopy head, toilet, kitchen, hot and cold water, washing machine cold water pipes, etc. Question: About how much time for cleaning? Answer: Generally single households are about 1.5 to 2 hours. 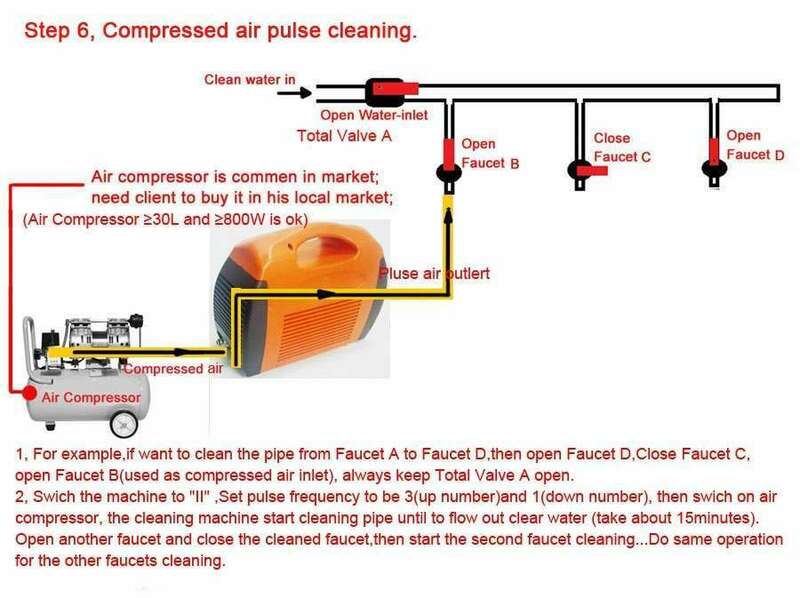 Question: Aerial pulse(High Frequency) cleaning method is to use compressed air to drive water to clean pipe with high frequency forward and back, will wash the old pipes to break? Answer: No.Because Smartclima`s Water Pipe Cleaning Equipment has its revolutionary design-Intelligent pressure controller.When pressure in the pipe is going to be over than the set pressure,the device will automatically stop immediately within 0.25s.Pressure limit value in Intelligent pressure controller can be adjusted according to pipe type,pipe material, pipe age,and scaling heavy or not. An approximate pressure value for reference. (1) 7.5bar for washing floor heating pipe. (2) 3-4bar for washing wall-mounted water heatingf boiler. (3) 6-7bar for washing Radiant iron water pipes,and 5-6.5bar for washing plastic PPR pipe. (4) Up to 5.5bar for washing other plastic pipe or aluminium-plastic pipe. Question: How often to wash water pipe? Answer: Wash one time per year in principle; if there is installed with water filters, can be washed every 2 years. Question: How to judge if the water pipe is dirty? Answer: when the water flow becomes slow and small; when water gas heaters point vain;when faucet end filter cards scale; when flow out rusty water from taps when you stop to use water 2-3days; when turbid water or sand water, or the pluming system more than five years in building. As long as there is one conditioner like above, it means you have to wash your water pipe. Question: What can I get after clean water pipe? Answer: the water from taps get soft,become more clear.When you wash your face with clear and soft water,you will become more young and more beautiful;You will get more health if you drink clear and soft water;the service life of plumbing pipe system will become more and longer. 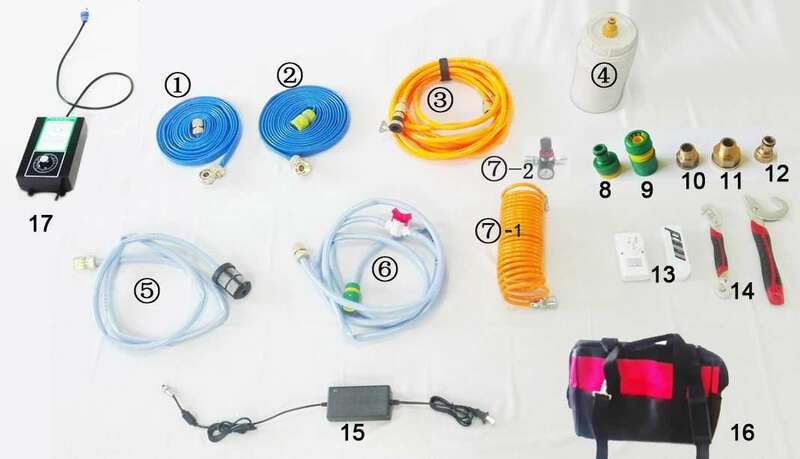 And if you are runing or going to run a water project installation company or water treatment service shop,with Smartclima Water Pipe Cleaning Equipment/Descaling water pipe tool kit,you can provide Pipe Cleaning Service to the end user and thus to get good profit. 1. Q: When can I clean? A: Any time,they can be cleaned,after stop supply heating is the best time to clean, in time to remove the formation of the heating period pipeline dirt, biological slime, the elimination of impurities and bacteria. To prevent the formation of deposits in the pipeline caused by pipeline embolization. 2, Q: It still need to be cleaned if the house temperature is still high ? A: Yes, need to be cleaned, and now the city has two ways:traditional heating and floor heating, so the water temperature is higher (floor heating water temperature should be around 55 degrees, traditional heating water temperature around 80 degrees). The resulting is to have high temperature to warm the home enough,and so some users put some warm water supply valve smaller or closed, so that the water to warm the pipe become slow, it is more easy to form a pipeline sediment, more likely to cause pipeline embolization, so more should be cleaned. 3. Q:What ways to clean? A: There are many geothermal cleaning methods,they are tap water flush, chemical washing, high pressure cleaning projectiles, pulse wave physics, combined with cleaning and other drugs. 4. Q: How long should be cleaned ? A: Two years ,a professional cleaning service .Any geothermal heating more than two period needs regular maintenance and cleaning service. For new household,it is best cleaned at once, because there are some unprofessional geothermal construction, the pipeline will have impurities, stones, cement,even serious situation that they do not install the filter, it is easy to block pipe in a short time. 5, Q: geothermal pipe design life is more than fifty years ? Why still need to be washed? A: The heat pipe is no problem even to use a hundred years. The problem is that the water into the pipe contains a lot of material inside which can be roughly divided into two categories: one is the minerals, calcium, magnesium ion is one of them, we know that change of termperature high and low will make the calcium and magnesium ions combine to form the dirt, though the heating water is softened, but due to excessive loss of water heating (especially floor heating warm loss more than traditional heating loss), mostly added heating water softening process is not ideal, so that water will still have a lot of calcium and magnesium ions; the other is the microbes under a microscope to watch, boiler water at 30 degrees Celsius, the water will produce some floc, along with an increase in water temperature and attached floc This does not scale the wall, forming a biological slime. Coupled with the inherent complexity of the shape of geothermal coils, pipes and other characteristics longer, after a certain period will form a pipe scale, can cause serious pipeline embolism, affect the cooling effect. So geothermal pipes need to be cleaned.